I finally took the first steps to start painting. There are no excuses now; I bought the paint and have five days off. The weather is warm enough to open the windows. Yesterday I prepared the kitchen; cleared the walls and cupboard tops; washing away cobwebs and smoke-stained corners (wood smoke; not cigarette). The plant corner was a jungle: I had to rip aerial roots off the walls and floor. 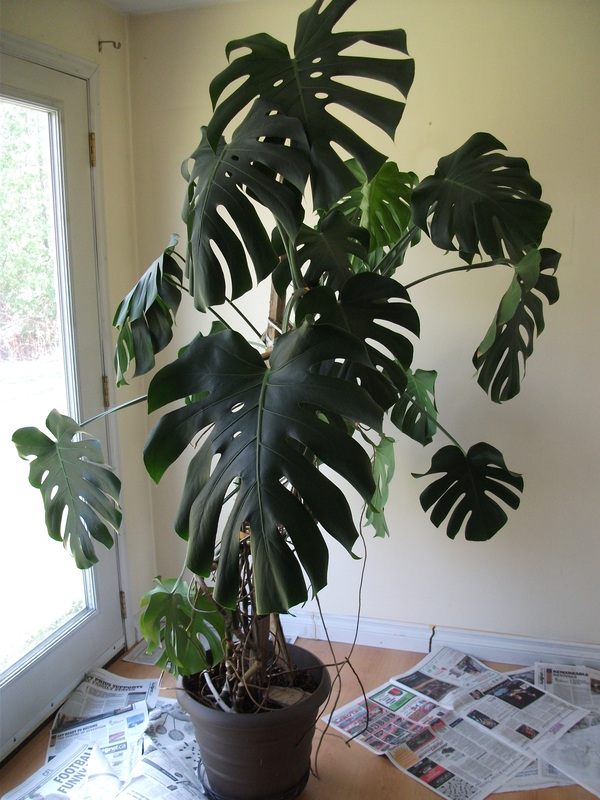 I have gigantic Philodendron that is way too big for this house but I don’t want to kill it. If a third person sits at my table, they have to sit under leaves. I’m hoping my niece, who is house hunting,will have a good home for it. It needs a big room. For now I cut a big plastic sheet to cover it and have to move it around. The ceiling in my kitchen joins the hallway and goes down to my computer/sewing nook: it’s one long ceiling so once started, I must continue. That’s one reason I’ve been putting it off: it’s a big job. I’m a big procrastinator to begin with but I’m really fighting with myself on this job. I just prepared yesterday….. but couldn’t make myself actually start painting. The other reason I’ve been putting it off is that I couldn’t make the final decision on what colour to paint the walls or what back-splash to order. Finally I’ve decided and now I’m excited to get the ceiling done and start the kitchen. I decided on a white back-splash and the cupboards stay ‘wood’ but I’ll dress them up with some oiling and hopefully be able to afford some fancy knobs. ( have turquoise crystals in mind but they may not exist) Sadly, I can’t afford new counter tops but my white with black flecked original Formica is still in good condition and will blend in with the new changes. Do you see what I’m doing here? I’m all ready to start painting but I’m sitting at my computer talking about what it’s going to look like when I’m done. I finished my coffee: stop procrastinating!